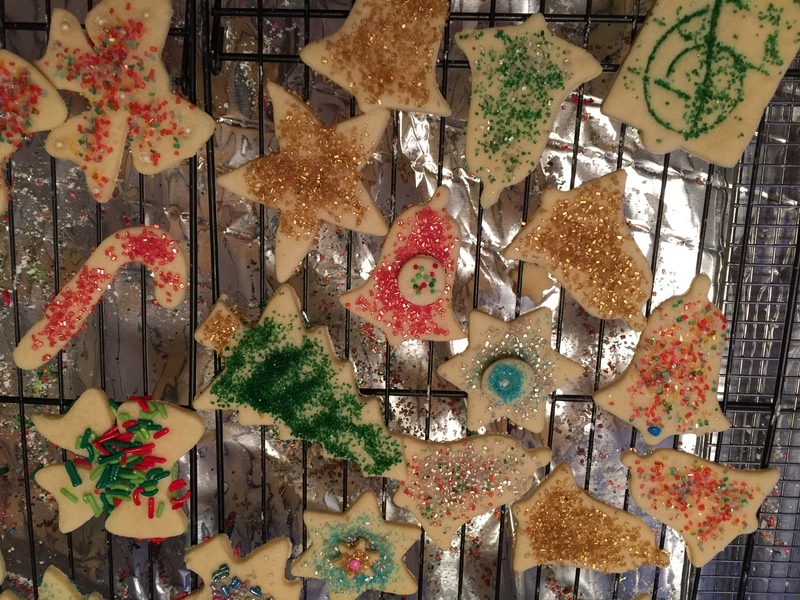 Every year I have made these cookies at Christmas since the early 1990s when I first discovered the recipe this is based on from “Best of Martha Stewart Holidays” book published 1993. I always add the optional brandy, but my twist is cherry brandy. I do colored sugars instead of the recommended icing, I double the vanilla and I always double the recipe. This recipe never, ever fails! For over 5 years, I have made these for my children’s birthdays as well, using alphabet cutters to make their initials. Most mom’s make a birthday cake, I make birthday cookies! Cookies are perfect to pass out as a cake alternative at the birthday party, and great to send in to school or for aftercare on the big day, to share with the kids. Everyone loves these cookies, they are crisp, sweet and have that special added kick from the cherry brandy in the background (don’t worry, the alcohol cooks out). They are quite easy to cut, the kids can manage keeping them together while cutting the shapes and getting them onto the cookie sheet. 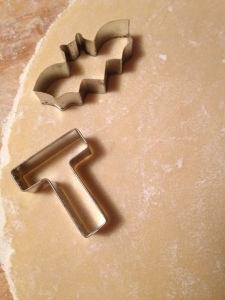 We make the dough and stick it in the fridge, then roll it an hour or two later, or whenever we have time that week. It keeps in the fridge for a few days without any issues. 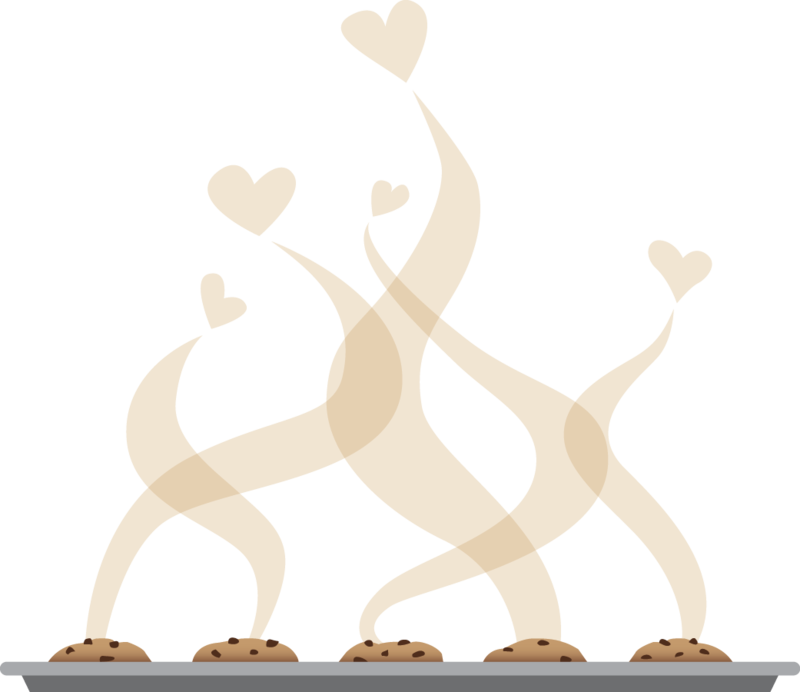 Below is doubled from the original and produces 60-100 cookies, depending on the sizes you cut out. Tip: The butter will come to a softened state in 10 or 15 minutes if you slice the sticks into small chunks on a plate and leave it on the counter. 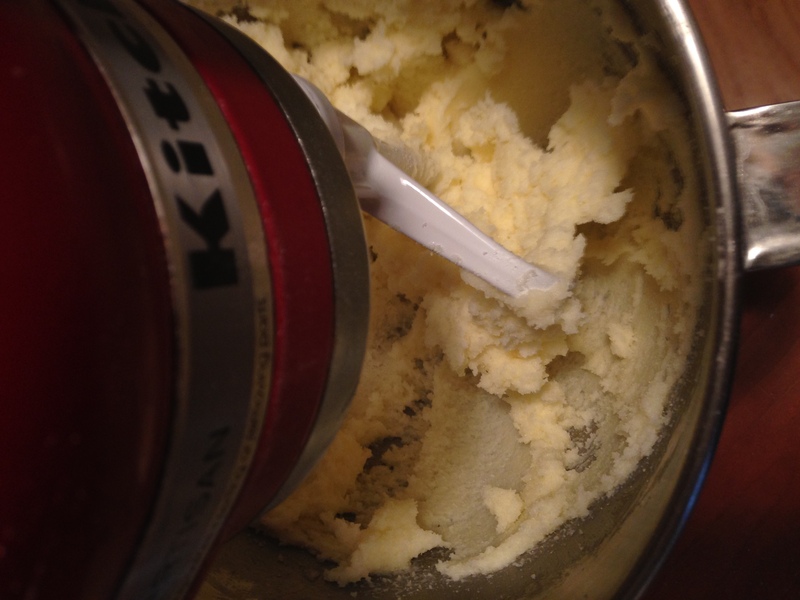 I use my Kitchenaid standing blender to cream the butter and sugar until well combined and fluffy. Then I put the flour, salt and baking powder into a medium bowl. Secret: I whisk the dry ingredients instead of sifting. Put the blender on lowest speed and add the dry ingredients slowly. The dough will seem very dry, not to worry. In a small bowl, beat together the eggs, vanilla and cherry brandy, then add to mixing bowl while blending on low, then medium. Once combined, the dough is complete. Take the dough and shape it into 3 equal balls, and cover each tightly in clear wrap and refrigerate for at least 1 hour and up to 5 days. 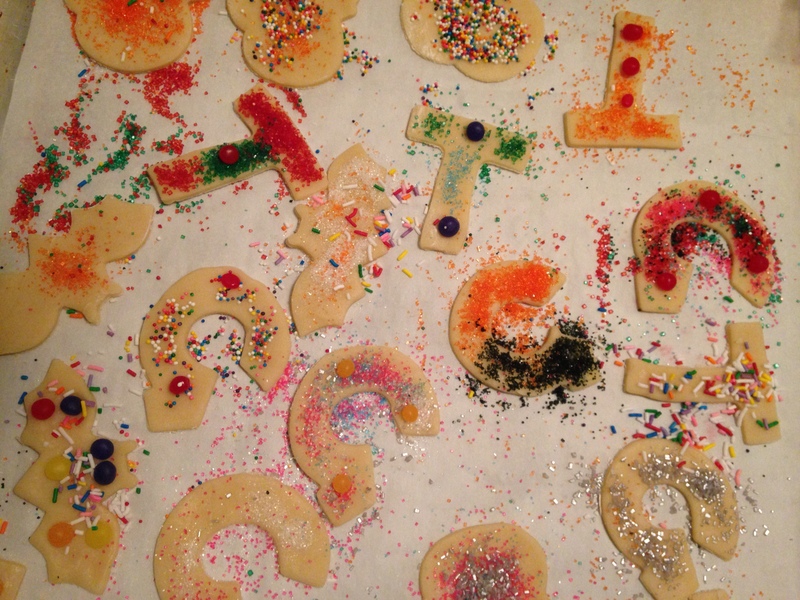 When you are ready to cut and decorate the cookies, preheat oven to 350 degrees. Grab the flour and roll the dough very thin, about 1/8 inch or a bit thicker. I cut the cookies and re-roll the dough scraps 2 or 3 more times (against the advice of Martha) and it works! I always cook them on parchment covered trays, easier removal and clean up. 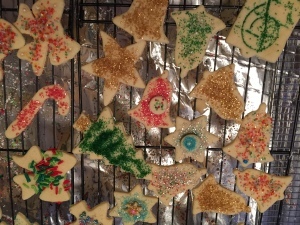 We decorate the cookies with colored sugars, sprinkles, candies and nonpareils. Bake for 10 minutes, maybe 11, but do not wait to see them brown. If they brown they don’t taste good. Remove from the tray and cool on racks, then store them in airtight containers for a week or in the freezer up to 1 month, or serve immediately and watch them disappear. These are both a birthday tradition and the star of the Christmas cookie tins, adding that touch of sparkle that truly says Merry Christmas!